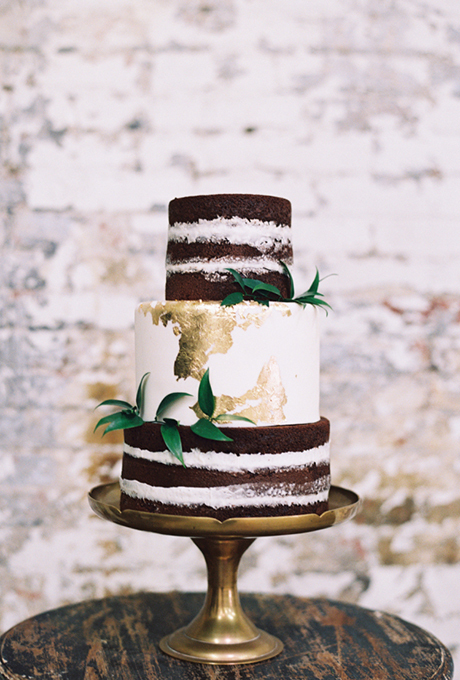 While the jury is still out on the whole “naked wedding cake” trend (since we do love frosting), this naked chocolate cake with the golden center tier is stunning. 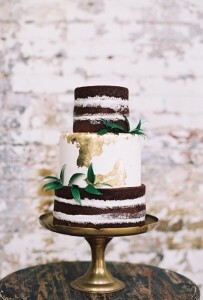 Naked chocolate cakes seem a bit more dramatic than a naked white cake and the addition of a gold-foil embellished center tier adds some glitz and glamour to a rustic-looking cake. The center tier is fully frosted with just a touch of gold foil – and you really don’t need much else on the cake. The addition of some greens is nice, but you could also add some seasonal blooms instead.